Recently I noticed my 500GB external hard drive used to store my iTunes library was filling up fast and about to run out of space soon. I looked around for a replacement external hard drive but I didn't like the idea of having to replace the new external hard drive in a few months. So instead of buying a new external hard drive I bought a Drobo and two 1TB external hard drives. I went for the Drobo mainly because if I need to increase the disc space all I have to do is swap out a hard drive and add a new one in. It also sort of backs up my data and protects it from hard drive crashes (as long as I have more than one hard drive in there) without requiring me to do anything. Setting the device up was a breeze. I just plugged in the hard drives I bought and then plugged the Drobo into my Mac via USB. I then just moved my iTunes library over from my external hard drive to my Drobo via iTunes and the task was complete. The transfer was so simple I decided to open up all my external hard drives and pull the drives out and put it into my Drobo to increase the space of my Drobo. I now have 4 hard drives sitting in my Drobo. As I had so much free space i decided that I would do something I had never properly done before.... back up my computer. I setup Time Machine to back up my Mac to the Drobo and now I have my machine backed up on a regular basis without requiring much interaction by me. As good as the Drobo is there are a few downsides. Although I have a total of 3TB worth of hard drive space plugged into the Drobo only 1.81TB of space to use as the other space is used to back up the hard drives (although this is also somewhat a positive). I previously plugged in all my external hard drives via firewire as I am a little short on space USB sockets but the Drobo can only be connected via USB, however I guess I might be able to get around this if I could be bothered to use an external USB hub. For the most part I can't really hear to much from the Drobo but there are occasions when the fan kicks in for a short period of time and it starts to make a really loud whirling noise. Also the Drobo is very expensive when you factor in the cost of a few hard drives you are easily into the few hundreds of pounds, but personally I see this as a long term purchase so over a long term it should be better value for money. All in all I am rather happy with the Drobo as it's been running away happily for a few weeks now and the shinney black finish and green and blue lights make it look cooler than the average external hard drive. I am looking to do the exact same thing. After looking around at various NAS options, a Drobo and streaming from my Mac to my stereo via Airtunes and an Airport Express seems like the best and simplest option. How is performances in iTunes accessing a large library of music stored on the Drobo? I worry about sluggish performance in iTunes access tunes on an external drive. I am also concerned about reliability when library size is terabytes in size. I am considering getting the Drobo 2.0 with FW800. My iTunes library is just around the 500GB mark and the Drobo has been fine for playback most of the time. Music ripped to Apple Lossless plays fine with no slow down. I have tried playing 30 minute long HD podcasts and playback doesn't have any noticeable slow down compared to my old external hard drive plugged in via Firewire 400. There have been the odd occasion when iTunes has stuttered for a second or two (it's only happened when searching through my library and not during playback) but is very rare and may not be related to the Drobo as I tend to have lots of applications and files running at the same time as iTunes and RAM and CPU cycles usage would be heavy. I would imagine the Firewire 800 connection would be better compared to USB as it should be quicker. I can't give much advice on Airtunes but I have streamed video and audio from my iTunes library to my Apple TV and again I couldn't spot any difference between my old external drive and the Drobo, however my network is a little slow so in both cases the streaming wasn't that great for large video files. I can't say I have noticed anything coming back after it being deleted. I have deleted the odd podcast and restarted my Mac and haven't noticed anything come back. 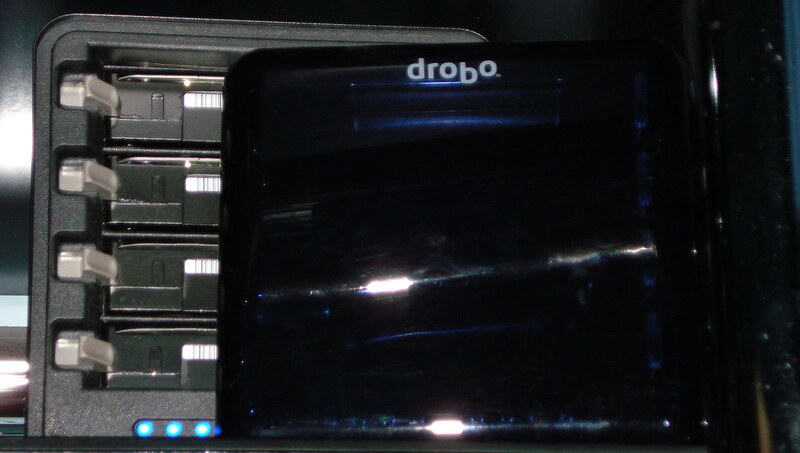 Which drobo do you have... Gen 1 or Gen 2 ?? Sadly I only have a first generation Drobo. I purchased my Drobo several weeks before they announced the second generation. I just got a Drobo to back up my CPU and would like to use it to store my Itunes library and access it from any computer on the network. I have copied the iTunes folder onto the Drobo - now how do I access the music from any computer? Do I have to install iTunes on the Drobo as well?